Calgary Coin offers for sale a selection of Canadian token and medallions including Breton Pre-Confederation and post confederation tokens, French Regime coins, merchant tokens and city trade dollars, with many types and a range of prices suitable to all collector levels. In this section I include the tokens, jetons and French coins used in Canada under the French Regime prior up to 1757. The following tokens were issued for use in Pre-Confederation Canada, with the reference numbers listed referring to "A CHARLTON STANDARD CATALOGUE, CANADIAN COLONIAL TOKENS", by W. K. Cross, The Charlton Press, Toronto Canada. There are some Foreign tokens used in Canada and catalogued by Breton but are not in the Charlton book, in which case I will reference to their Breton numbers. Wellington tokens are named such because they have a portrait of Wellington on the obverse. Most were struck in England for use in England between 1812 and 1814, although one large issue are the 1812 types were for by English troops in Spain and Portugal during the Peninsular Campaign of the Napoleonic wars. A few are also of Irish origins. By some time in 1814 their use in England was banned so many were shipped to the British colonies for use, and some may have been carried over with British Troops sent to fight in the America's during the War of 1812. These tokens were used in Canada but their circulation here was limited, and mostly in Lower Canada. In 1825 Canada banned the importation of private tokens, although those already in Canada continued to circulate. There were people who continued to make and bring in such tokens illegally, but had to put pre-1825 dates on them so they could claim they were already here before 1825. The Wellington tokens dated 1805 and those dated 1814 to 1816, are mostly of this status and probably all made after 1825 but their exact date of issue is not known. The Cossack coinage is not dated but probably was made in 1813. In 1791 the Constitutional act was passed, dividing the British colony in Canada into the Provinces of Upper and Lower Canada, with the Province of Lower Canada being largely the southern portion of what is now the province of Quebec. In 1840 Upper and Lower Canada to again re-joined to become the British territory known as the Province of Canada. Because of the rebellion of 1837, the Constitutional Act of 1791 was suspended and in 1838 a special council was appointed to run the colony. In 1840 the Union Act was passed to re-unite the Provinces of Upper and Lower Canada into the Province of Canada, although the act did not become official until 1841. Under the Province of Canada only bank tokens were issued and no merchant or private tokens were allowed. No Province of Canada tokens were issued after 1857, as the British government introduced 1, 5, 10 and 20 cent pieces in 1858 (which you will find listed under the appropriate headings of standard Canadian coins). 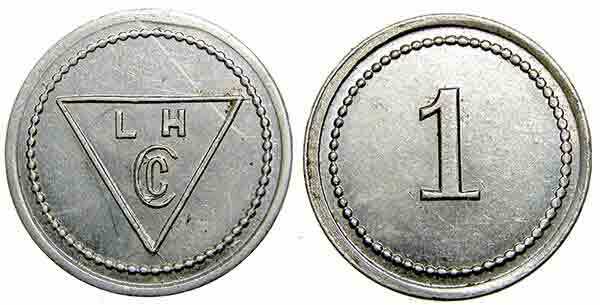 Blacksmith tokens refers to locally made counterfeit tokens made to pass in circulation as official coins and tokens. They are very difficult coins to grade as they made to look worn out so they would not stand out along side the worn official coins and tokens they copy. Even the nicest ones would only grade G to VG if you were grading on as one of the official coins they copy, when in fact as a blacksmith token they might actually grade VF or XF. Such counterfeiting was common all around the world at the time, and only those types believed to have actually been struck in Canada can be properly called Canadian Blacksmith tokens, and are identified by die variety. A full listing of the known types accepted as Canadian can be found in "A CHARLTON STANDARD CATALOGUE, CANADIAN COLONIAL TOKENS" book. This section lists tokens of foreign manufacture that either circulated in Canada, or were brought to Canada by collectors because they were similar to tokens that circulated here and which are listed in "A CHARLTON STANDARD CATALOGUE, CANADIAN COLONIAL TOKENS". Transport tokens were used as tickets or passes on ships and railways. Only a handful of such tokens were issued in pre-Confederation Canada. Breton Tokens are token published by P.N. Breton in his book "Popular Illustrated Guide to Canadian Coins, Medals, etc" in 1894, and includes items from both before and after Canadian confederation of 1867. In recent years, those tokens issued before confederation have come to be known as "Pre-Confederation tokens" and are listed separately above by their Charlton numbers. The post-confederations token are below, and are listed by their Breton number. In some cases, there will be varieties where Breton only listed one example of a type, but it may exist in a variety of metals, or with minor varieties, which we will note where possible. The Hudson Bay Company issues a variety of tokens between the 1850's and 1940's, and all are now getting difficult to find. The reference on these (who's numbering system we refer to) is MEDALS TOKENS AND PAPERMONEY OF THE HUDSON'S BAY COMPANY, by Larry Gingras, 1975. The East Main District was a region east and south of Hudson's Bay. Some time around or just after 1854 the Hudson Bay Company issued a set of four brass token denominated in 1/8, 1/4, 1/2 and 1 "made beaver". They are marked NB for Made Beaver due to an die cutters error in England where they were minted, but were used in spite of this error. Many of these tokens have a small punch mark at the bottom of the reverse, which is sometimes referred to as a cancellation, but it is now believed they punch marks mark them for use at a different trading area, and there is evidence they were made a few years after the un-punched examples. 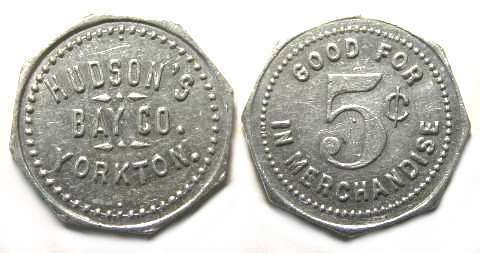 Labrador District tokens were first issued some time around 1919 to replace the "Parson's tokens". There are two different sets, the earlier type with the denominations 1, 5, 10 and 20, which were denominated in "Made Beaver" but do not have the MB on them, and the reverse is nearly blank. A later set was issued in 5, 10 and 20 denominations, and have the unites on the obverse, and the unit with "MB" on the reverse. While Gingras describes the first set as being in tin or white metal, and the second set as aluminum, all of the first set examples I have seen were aluminum. In 1922 the ST. Lawrence and Labrador Districts were joined with tokens issued about 1923. The set of composed of 1, 5, 10 and 20 made beaver (MB) denominations in round aluminum, each of which can be found with either small or large letters. Mr. Gingras in his book on HBC tokens and medals states they are fairly comon but assembling a well match set has always been somewhat difficult. Ungava Bay is in the very North East corner of the territory of Nunavut. Ungava Bay District tokens were issued in the early 1920's in denominations of 1, 5, 10 and 20 Made Beaver (MB) and used until no later than 1941. In 1975 Larry Gingras recorded only one each of the 1 and 10 MB were known which have to be the same examples from the Don Stewart collection at the time sold in the 1994 Jeffrey Hoare Auction and which are now in the Bank of Canada collection along with a 5 MB from a different source. In recent years 1 each of the 1 and 5 MB were sold on a 2011 Charles Moore auction, and again but different examples on the 2017 Geoffrey Bell Auction. The 1 MB I offer below is a different example again. In total this means I am aware of 4 examples of the 1 MB, 3 of the 5 MB, 1 of the 10 MB, and none of the 20 MB, including those in the Bank of Canada collection. It is likely a few more exist but probably not many. All denominations are rare. The Hudson's Bay store at Yorkton Saskatchewan was opened in 1898, but these tokens appear to have been issued sometime around WWI. The General manager had them minted and used them to pay local farmers for the produce they brought in. A full set of the tokens would include a 5, 10, 25 and 50 cents, as well as a $1.00 token. Today it is very difficult to assemble a full set, with only the 5 and 10 cents usually available. The Hudson's Bay operated a post at Onion Lake, just north of Lloydminster Saskatchewan from 1887 to 1928. Token were issued most likely about 1920 give or take a few years. At this time only three denominations are known, 5 cent, 25 cent and $1.00 although it is likely 10 cent and 50 cent tokens may have been issued, and there is a vague unconfirmed report someone once saw a $5.00. All Onion Lake tokens are rare but one occasionally sees the $1.00, less often the 25 cent and the 5 cent is seldom encountered (I have never had one). I have seen an estimate of about 26 examples between all three denominations combined, several of which are in the Hudson's Bay archives and bank of Canada collections. Based on how many I have seen over 30 years I suspect that estimate is slightly low but not by much. There are probably less than 40. In about 1946 the Hudson's Bay Company issued rather simple tokens for use in Arctic trading posts on the East side of Hudson's Bay. They were used to facilitate trade inside the posts while teaching the local Inuit how a decimal monetary system. They tokens were never meant to leave the posts to be used later. 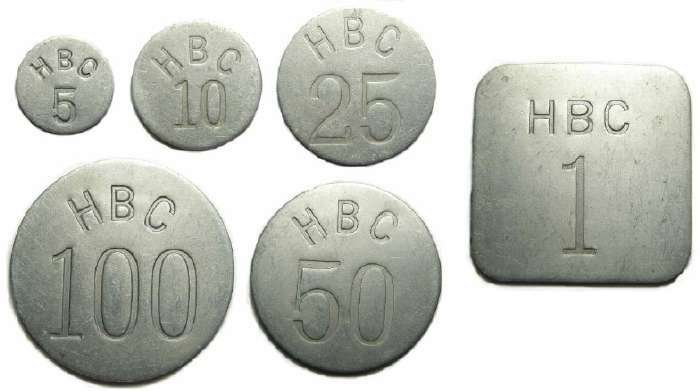 I have seen a Canada Film board documentary on the arctic, made about 1957 with a scene shot inside a HBC post where these tokens can be seen piled on a counter. 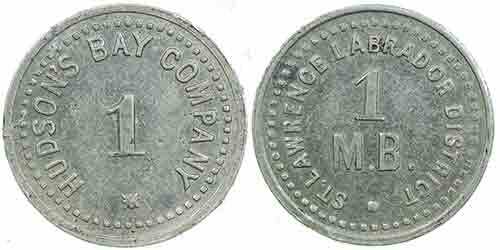 Use of these tokens was discontinued in 1962. The five tokens denominated in 5, 10, 25, 50 and 100 cents are sometimes collected as a set unto themselves. The large square token denominated as "1" (WHITE FOX) is also often collected by itself or as part of the set, but I have recently seen evidence it might have been issue separately from the others (I am working on a website about that). For the 300th anniversary of the Hudson's Bay Company in 1970, Dora de Petry Hunt was commissioned to design three medallions although with size and other variations there are five types. A unique cast with the added inscription "CHURCHILL MANITOBA" was presented Governor General Roland Michener. 100 roughly 98 mm bronze castings of the regular design were made for presentation to VIP's. 47,000 of 45 mm bronze were struck for share holders in their 1970 annual reports plus some were given to staff. 2463 of the 45 mm bronze were later nickel plated and sold to the public. 11,500 at 39 mm bronze were struck for sale to the public as either as loose medals, in lucite paper weights or as pendants. This information comes from MEDALS TOKEN AND PAPER MONEY of the HUDSON'S BAY COMPANY by Larry Gingras, published by the Canadian Numismatic Research Society, 1975). While the mintage for the 45 mm bronze was more than 4 times that of the 35 mm bronze and nickel medals, in my experience the 45 mm examples are much harder to find. Lamson and Hubbard was an American furrier from Boston who in 1918 which opened a Canadian division under the name Lamson and Hubbard Canada Company Ltd, to compete with the Hudson Bay Company in the Canadian North. They started by purchasing 7 pre-existing fur trading posts, but quickly built up to 35 posts, but lacked the financial resources to survive a recession in the early 1920's and went out of business in 1923. Their tokens were issued from Baker Lake in the Northwest Territories (now Nunavut) right around 1920. They are denominated in "Made Beaver" skins, just as many of the HBC tokens were. A complete set of Lamson and Hubbard tokens would include a 1/2, 1 and 5 MB. These tokens are rare, and the last time I had a full set available was in the late 1980's. Even single tokens are rarely offered for sale. Both on the image and with the token in hand, there appears to be a scratch. Viewed under a microscope, it is actually a whitish line of aluminum with a different surface texture and is an irregularity on the flan before this token was struck. The North West Company was a fur trading company based in Montreal. Discussions of forming it to compete with the Hudson's Bay Company probably started around 1770, and a loose affiliation of shareholders forming in 1779. In the winter of 1783-1784 the company took on a more formal existence with the establishment of a head office, then in 1787 it merged with an active group of fur traders at which point the North West Company became an active fur trading company. In 1892 they established a London House to supply trade goods and market furs, a necessary step for expansion. They later expanded into the US market, establishing a branch office in New York City which allowed their ships to sale under the American flag to trade in China, avoiding the British East India Company's English monopoly. There were many ups and downs. In the late 1790's some partners left to form a rival XY company, but even with that in 1800 their profits were four times that of the Hudson's Bay Company who took note and actively retaliated. Relations between the NWC, XY company and HBC sometimes turned violent. The War of 1812 further complicated things when NWC employees were restricted from entering the USA, but that also opened up new territories in what is now Oregon and Washington state when the Pacific Fur Company expected to be over run by the British so sold Fort Aster at the month of the Columbia River to the NWC who later renamed it Fort George, giving them trading rights in the Columbia River Basin. Between 1812 and 1820 there were many problems for the fur trade in general, economic, political and violent. In 1821 although bigger than the HBC with 97 posts to the HBC 76 posts, the NWC was forced to merge into the HBC. In 1820 the North West Company issued tokens with an obverse depicting George III with TOKEN above and the date 1820 below. The reverse depicts a beaver with NORTH WEST COMPANY above and below. As they say token on them they are generally assumed to be monetary instruments valued at a beaver pelt. I personally question this for two reasons. First, virtually all known examples were found Native American sites along the Columbia River, connecting them to Fort George where the fur trade focused more on sea Otter than beaver. Secondly, all but one example in the Canadian National collection in Ottawa are holed with same sized hole in exactly the same place. This is not consistent with the general assumption they were holed by Native Americans to be worn, but rather it shows they were holed prior to issue, possibly at the Birmingham mint. I personally think they are NWC company equivalents to the HBC trade silver issued with only the intention they be worn decorations. Today nearly all known examples have significant corrosion because of how and where they are found. Robert Cunningham started with the Hudson Bay Company working his way up to Chief Trader at the Fort Simpson trading post. He left the HBC in 1870 and drawn by the BC Gold Rush in BC he moved to Hazilton in 1871, setting up his own trading business in Gitxsan tribal territory sometimes known as the Skeena area. His original trading post was at Hazilton then in 1871 he bought property at the confluence of the Skeena and Ecstall rivers on which he built his main store in 1872 although it appears he operated out of both locations for some time. The dating of his tokens is uncertain but of his five children by his first wife, three died in childhood, and after John died in a shipwreck at age 17 in the early 1880's, only George survived to adulthood. George became a partner in the business some time close to 1895 and as it says "AND SON" on them, that is likely the earliest they could have been issued. Robert died in 1905 so they would not be after that. His token were first issued without the H countermark so were likely used in his main location where he did more general business. Some examples were counter marked with an H for Hazilton which was his original but by the 1890's less important location but being on tribal want was likely still involved in the fur trade. HAZELTON. $1.00 for R.C. & SON, countermarked H.
AND ANY OTHER FUR TRADE TOKENS. Counter marks were applied to both coins and tokens for a variety of reasons, but one of the common ones was to turn them into a token that could only be spend in the store of the person who applied the countermark. As they are often on coins that were old when applied, the base coin/token and the countermark must be graded separately. I will list the grade of the countermark first, followed by the grade of the base item. In this section I list countermarks either known to have a Canadian origin, or are on Canadian coins or token even if they might have been done elsewhere. The main book on Saskatchewan tokens, and who's reference numbers we use below and from which much of our information on these tokens is drawn, is "SASKATCHEWAN TRADE TOKENS, PAPERE MONEY, SCRIPT" by Cecil C. Tannahill, F.C.N.R.S, published 1980, with a supplement of new additions and rarity changes (uncertain date). ALTONA, Lowan & Sons, G/F 10 cents, 26 mm. 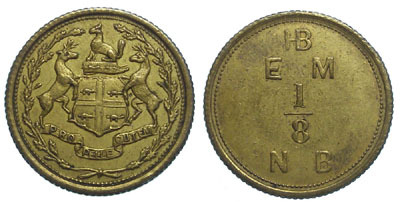 ALTONA, Lowan & Sons, G/F 25 cents, 29 mm. ALTONA, Loewan & Sons, G/F 5 cents, 26 mm. ALTONA, Loewan & Sons, G/F 10 cents, 26 mm. ALTONA, Loewan & Sons, G/F 25 cents, 29 mm.